Once people realize the power of content marketing, a light turns on in their minds. Oh, so this is how I can get traffic from search engines and social media! But the light turns off just as fast. I don’t know what to write about. Or more often: I don’t have time to write. This post will show you how to create content, even when you have no ideas and no time. We’ll do it by finding a topic and then finding people to write about it. The web is packed with writing ideas. 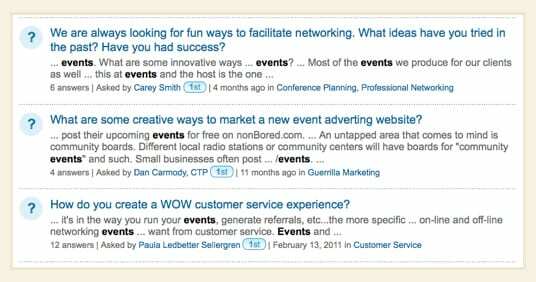 Question and answer sites like Quora.com, Focus.com and LinkedIn Answers have huge lists of questions and responses. Search these sites for a topic related to your business. Example: If my company does event planning, and I search LinkedIn Answers, I might see this. Any of these would make a great blog post! And questions make excellent headlines. As you browse through the list, look for those that have a lot of answers. This is a sign that the question is interesting to readers and would be successful. Pick one that aligns with the interests of your readers and, if possible, the services your company offers. Now you’ve got an idea that’s been validated by an online community. Visit followerwonk.com and search for people who would be qualified to answer. Followerwonk will sort by the size of the Twitter following. When you write about someone, they’re likely to share it through social media. 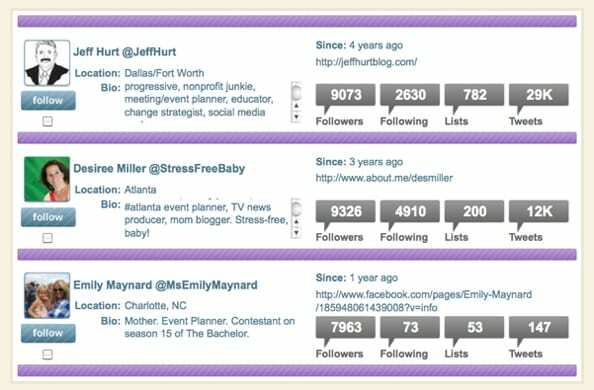 By selecting people with big followings, the content will reach much farther. Move the conversation to email. Make it easy for them, mention the benefits, and be nice. Offer to link back to their websites or their twitter accounts along with a mini-author bio of a few sentences. Offer to show them a draft before you publish. Promise to promote the content through your networks. Variation: Rather than sending one question to several people, send one person several questions. It’s time to assemble the post. Really, you’re just copying and pasting the answers together under the question. Pretty simple. Write a short introduction framing the importance of the question to your readers. Look for places to link back to your services in this quick intro or within the answers themselves. If possible, follow the entire web content checklist. Time to go live with your new post! Make sure to let the contributors know when it’s live. Thank them publicly. Use the headline / question in tweets and posts. Don’t forget to go back to the website where you found the question and add a response with a link to your post. There are many ways to do content promotion, but this one goes perfectly with this technique. There you have it. Instant Content! You started with no clue and no time, and you created a relevant, easy-to-promote blog post. It’s possible to go through this entire process in under 30 minutes of combined time. Need more help? Here’s another recent post with tips on how to overcome writers block. Hope this helps! Great article. it is kind of a “work around” for writer’s block. 🙂 A variation might be to have a friend ask you these questions and record your verbal answers. Then transcribe and add your own flavor to the conversation. proTIP: start on paper. Pen & Paper. it’s easy to get lost in the interwebs while trying to write, so unplug. @gzlatin Not yet. Should we build something? A method that works for those that struggle with time and creative block – email conversation posts. Not sure if you’re a big sports fan, but I got this idea recently from Bill Simmons, as he created a column, simply based on a thread of email convos with Malcolm Gladwell. Now this one in particular was longgggggg as hell, this could easy make for 5 awesome posts. While reading it, I noticed how engaged I was in their conversation. I think if you just set some preemptive guidelines with someone you’re conversing with via email, such as ideas/subjects/questions/objectives you hope to accomplish, you can really get a great conversation going. It’s a free-flowing conversation, and you just need to reply in small bursts throughout a day or week. Just make sure to provide enough context in your intro for readers. Actually, I thought of another option: You could take Step 2 and consider a member of your own organization who has first-hand experience with a relevant topic. Then follow the same steps to the end. This not only gives you relevant and timely content, but it promotes the expertise of an important team member from your own company. Plus, as an owner or manager, you gain insight to the minds of your team. Today I found another place to get ideas for topics: WordTracker Keyword Questions. Just enter a topic and it will give you a list of common questions associated with that topic. Pretty easy! I come from a generation that was around before the computer and yours blog/pop(bst/article got me thinking that the differences between our generations are… How you see the world without people who live within it, or should I say, “from a different perspective” (one being neither better than the other, just different), I was struck with your picture you paint the readers head of a whole subculture vithin a aub-culture of a culture. It brought to my attention another way of thinking. Very refreshing.